How to watch Dragons: Race to the Edge: Season 6 (2017) on Netflix Argentina! Sorry, Dragons: Race to the Edge: Season 6 is not available on Argentine Netflix, but you can unlock it right now in Argentina and start watching! With a few simple steps you can change your Netflix region to a country like Australia and start watching Australian Netflix, which includes Dragons: Race to the Edge: Season 6. We'll keep checking Netflix Argentina for Dragons: Race to the Edge: Season 6, and this page will be updated with any changes. 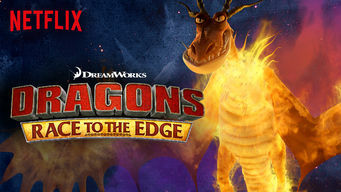 Dragons: Race to the Edge: Season 6 is not available in Argentina BUT it can be unlocked and viewed! From the creators of "How to Train Your Dragon" comes a new series that takes Hiccup and Toothless to the edge of adventure. What do you do when riding your dragon around a peaceful island gets old? Look for more dragons! Season 1 of Dragons: Race to the Edge has 13 episodes. Because different Netflix countries have different availability for episodes, you'll need to check the episode listing below to see which are available in Argentina. During their search for the escaped Dagur the Deranged, Hiccup and the Dragon Riders discover a mysterious object -- one that holds their destiny. Hiccup and the Dragon Riders journey to Glacier Island to find the Snow Wraith, a fearsome dragon that holds the key to the Dragon Eye's mysteries. On an island that will make the perfect outpost, the Dragon Riders discover that the indigenous residents are a mysterious new breed of dragon. Thinking he's allergic to his dragon, Fishlegs gets hypnotized. He wakes up transformed into an invincible warrior known as Thor Bonecrusher. Fireworms invade Dragon's Edge, while Ruffnut and Tuffnut discover that they have an unexpected connection to the island. As a Rumblehorn wreaks havoc on Dragon's Edge, Hiccup seeks the help of Stoick, who forms an unexpected bond with the rampaging beast. Heather joins the Dragon Riders, but it's not an easy alliance, especially when Hiccup uncovers a shocking secret about her true identity. Season 2 of Dragons: Race to the Edge has 13 episodes. Because different Netflix countries have different availability for episodes, you'll need to check the episode listing below to see which are available in Argentina. 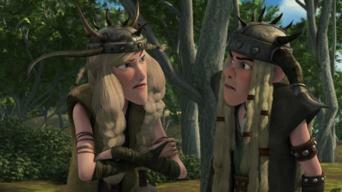 After an attack on Berk, Astrid trains a crew of backup Dragon Riders to battle back -- but no one can guess how soon the next strike will hit. A new enemy named Ryker Grimborn captures Stormfly, sending Hiccup, Toothless and the team off to rescue her before it's too late. As Hiccup and Snotlout race to rescue the others from the Dragon Hunters, they don't realize that someone close to them is working with the enemy. After a strange creature bites Tuffnut, he believes he'll turn into a legendary Lycanwing dragon when the moon is full. Can his friends save him? Snotlout and Astrid must deliver a special battle axe to a family wedding, but when an Armorwing dragon derails their plan they have to work together. After Hiccup and Toothless heroically save Barf and Belch, the grateful Zippleback tries to repay its life debt by abandoning riders Ruff and Tuff. Ryker is determined to create a key to the Dragon Eye, so he heads to Glacier Island to find the Snow Wraith that the Dragon Riders are protecting. When Ruffnut is captured by Dragon Hunters, it's up to Astrid and Tuffnut to defend Dragon's Edge from the invading Dragon Hunter army. Unaware of the war on Dragon's Edge, Hiccup, Snotlout and Johann discover an island full of dragons that have been wounded by the Dragon Hunters. When a new dragon is found in Edge Cove, the Dragon Riders must help the Sea Shocker escape a group of hungry Scauldrons. 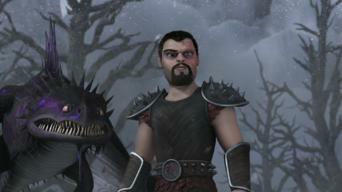 The Skrill returns with a grudge against Hiccup and Toothless, and the Dragon Riders must choose a new course of action to stop the vicious dragon. Hiccup and Astrid race to stop the Dragon Hunters from tracking the Flightmare after Heather spills secrets from Viggo Grimborn. After Heather and the Flightmare have been captured by Viggo and the Dragon Hunters, Hiccup must hatch a plan to outwit the dangerous new enemy. Season 3 of Dragons: Race to the Edge has 13 episodes. Because different Netflix countries have different availability for episodes, you'll need to check the episode listing below to see which are available in Argentina. 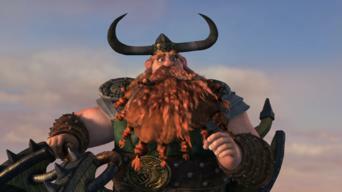 Hiccup's and Snotlout's fathers put aside their differences and work with their sons as a team to defend a storehouse against an unusual invader. Season 4 of Dragons: Race to the Edge has 13 episodes. Because different Netflix countries have different availability for episodes, you'll need to check the episode listing below to see which are available in Argentina. Tuffnut is eager to impress his visiting cousin, Gruffnut. But Ruffnut is suspicious of his real reasons for coming to Dragon's Edge. The Dragon Riders attend Berk's 400th anniversary celebration, where a bounty on Hiccup's head casts a dark shadow over the festivities. After getting bad advice from his father, Snotlout tries to seize leadership of the Dragon Riders and starts making reckless decisions on his own. When a dragon that causes man-eating whirlpools threatens Berk's trade ships, the Dragon Riders must remove it without getting caught in its vortex. With his teammates grounded due to lack of sleep from the midnight sun, Hiccup tries to help a hurt dragon alone, but suddenly gets in over his head. When Dagur appears at the Edge claiming to know where Viggo keeps his gold, the Dragon Riders fly off to find the stash and return Berk's stolen gold. To ensure the future survival of Mala's tribe, she and Hiccup must deposit a newly laid Eruptodon egg into the deadly Grand Volcano so it will hatch. When the twins fly to the Northern Markets to get Tuffnut's mace fixed, a chance turn of events lands them inside a secret Dragon Hunter operation. While rescuing the dragons from a fire in the stables caused by a powerful lightning storm, Astrid suffers an injury that leaves her blind. 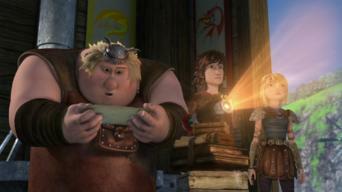 After months of planning, Hiccup launches an operation to capture the Dragon Eye from Viggo, only to find that someone else has beaten them to it. Season 5 of Dragons: Race to the Edge has 13 episodes. Because different Netflix countries have different availability for episodes, you'll need to check the episode listing below to see which are available in Argentina. While trying to stabilize the volcano that threatens to destroy Dragon's Edge, the Riders discover troubling evidence of new Hunter activity. As the Riders investigate why traders are disappearing from the Northern Markets, Hiccup and Snotlout fall victim to a treasure-hoarding dragon. The Riders accept an invite to Berserker Island, where their reunion with Heather, Dagur and a young familiar face is interrupted by a sudden revolt. Disobeying Hiccup, the twins follow a retiring Eruptodon to its final resting place, Vanaheim, and learn why no human has ever gone there before. When a pair of Outcasts visits the Edge seeking the help of Thor Bonecrusher, Fishlegs allows Snotlout to hypnotize him to evoke his mighty alter ego. After the Edge is ambushed by a group of Singetails, the Riders quickly take flight to ward them off, but are shocked when they get a closer look. After Stormfly tangles with two poisonous Slitherwings while defending Garff, Astrid must risk her own life to get an ingredient to make an antidote. When Ruffnut refuses to become Throk's bride because it would mean leaving her twin, Tuffnut fakes his own death to give her the freedom to marry. A sketch in an old diary leads Hiccup and Fishlegs back to Vanaheim, where they help Dagur search for his long-missing father, Oswald the Agreeable. Season 6 of Dragons: Race to the Edge has 13 episodes. Because different Netflix countries have different availability for episodes, you'll need to check the episode listing below to see which are available in Argentina. While visiting Wingmaiden Island, a baby Razorwhip bonds with Ruffnut, who suddenly finds herself trying her hand at being a Wingmaiden.